Six hundred and forty pigs with an initial average body weight (BW) of 11.1 ± 1.4 kg were randomly allotted to 20 diets and 5 blocks in a randomized complete bock design. There were 8 replicate pens per diet and 2 barrows and 2 gilts in each pen. Twenty corn-soybean meal-based diets were formulated using a 4 x 5 factorial design. Diets contained 0.16, 0.33, 0.42, or 0.50% STTD P, and 0.14, 0.29, 0.44, 0.59, and 0.74% STTD Ca. Data for growth performance, bone ash, and abundance of genes were analyzed using a second-order response surface model. The model to predict ADG and G:F was reduced because only the interaction (P < 0.01) between STTD Ca and STTD P was significant (Fig. 1). 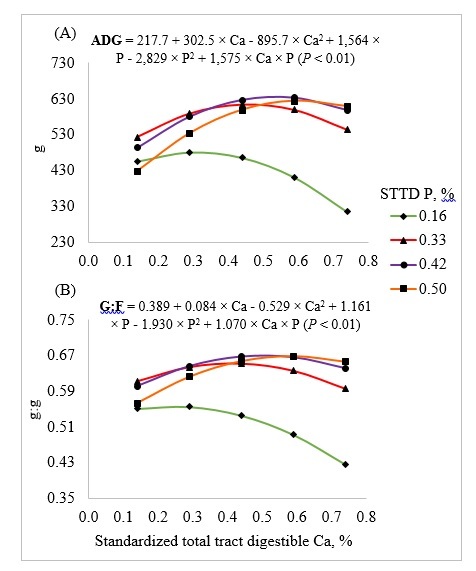 The predicted maximum ADG and G:F at STTD P concentration of 0.33% was 614 g and 0.652 at STTD Ca concentrations of 0.46 and 0.41%, respectively, corresponding to STTD Ca:STTD P ratios of 1.39:1 and 1.25:1. Diets containing 0.33% STTD P are believed to be at the requirement for P.
The full model was used to predict the concentration of bone ash in g per femur (interactions, P < 0.01; Fig. 2). 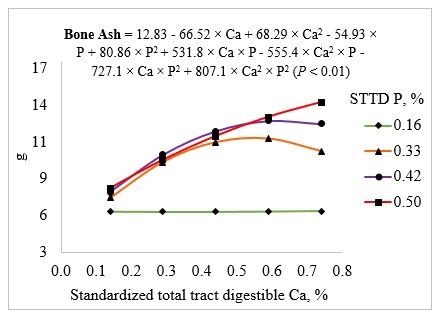 The predicted maximum bone ash at STTD P concentration of 0.33% was 11.68 g at a STTD Ca concentration of 0.55%, corresponding to a STTD Ca:STTD P ratio of 1.66:1. Tested genes included S100 calcium binding protein G (S100G) and transient receptor potential cation channel, subfamily V, member 6 (TRPV6) for the duodenal tissue; and Occludin (OCLN), Zonula occludens-1 (ZO1), and Claudin-1 (CLDN1) for both duodenal tissue and ileal mucosa. Genes S100G and TRPV6 are related to transcellular absorption of Ca, whereas OCLN, ZO1, and CLDN1 are thigh junction genes related to paracellular absorption of Ca. Neither Ca nor P could be used to predict the abundance of CLDN1 in the duodenum or the abundance of OCLN in the ileum. The model to predict the abundance of TRPV6, S100G, OCLN, and ZO1 in the duodenum and the abundance of CLDN and ZO1 in the ileum only contained the linear (P < 0.05) STTD Ca term, and for all genes, the slope of the prediction line was negative. This means that abundance of these genes is negatively affected by dietary Ca and increased dietary Ca, therefore, appear to reduce the transcellular absorption of Ca and increase the paracellular absorption. Maximizing bone ash requires a greater STTD Ca:STTD P ratio than maximizing growth performance. If dietary P is deficient or adequate, increasing dietary Ca reduces growth performance, but if P is above the requirement, the negative effect of excess dietary Ca is partly or fully ameliorated. Increasing dietary Ca reduces transcellular absorption of Ca and increases paracellular absorption of Ca. Figure 1: Models and predicted values, based on the interaction between Ca and P (P < 0.01), for (A) average daily gain (ADG) and (B) gain to feed ratio (G:F) at d 21 in pigs fed diets containing from 0.14 to 0.74% standardized total tract digestible (STTD) Ca and from 0.16 to 0.50% STTD of P.
Figure 2. Models and predicted values, based on the interactions between Ca and P (P < 0.01), for bone ash in grams per femur (g) at d 21 in pigs fed diets containing from 0.14 to 0.74% standardized total tract digestible (STTD) Ca and from 0.16 to 0.50% STTD of P.